I have to admit that I'm pretty excited, even though I should be used to this by now. I got an email earlier this week about the new issue of OC Riviera Magazine. I have two spreads in it. I wanted to show them to you and tell the back story behind them as well. OC Riviera is Orange County's Modern Luxury Magazine. I was offered two really cool assignments for this month's issue. 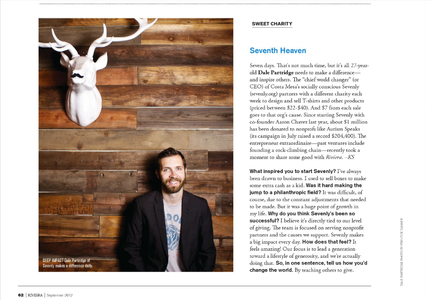 The first is a portrait of Dale Partridge, the CEO of a charity organization called Sevenly. They take on a new charity every week and make t-shirts specific to that cause, and then donate the proceeds. It's an amazing outfit and they have raised over $1 million for charities. I used a Profoto D1 Air monolight for this image, with an umbrella that came in the kit. It was my first time using it, and I was impressed. Profoto killed it with this light. We shot in Sevenly's office in downtown Fullerton. Dale was a great subject and we had a good conversation during the hour or so we were able to shoot for. The second story for Riviera was a profile on another successful entrepreneur, Celine Oaknine. Celine designs shoes for a company called Titan Industries. The assignment was a day in the life of Celine, and it was really interesting to see her process and her perspective on design. The main image from this spread was shot in the Titan Industries building using a studio strobe through a Photek Softlighter. Celine is comfortable in front of the camera and made for a fun and easy shoot. It's really cool to see assignments come to be printed. It's kind of the 'arrival' of photography, where it comes full circle. Can't wait until the next set of assignments, as each one you see printed makes you want to do the next one better. Until next time.